In recent years, to protect workers in the construction industry against exposure to hazardous chemicals, the Ministry of Labour removed the exemption to Ontario Regulation 833 that construction projects enjoyed. This regulation sets out requirements for protecting workers against chemical exposures and to abide by the current Ontario legal limit for respirable crystalline silica (quartz & tripoli) of 0.10 mg /m3 TWA. Silica is very common in construction. It is a major component of sand, cement, gravel, stone, brick and mortar. It can be present in asphalts, roof coverings, joint compounds, plaster, caulking compounds and mastics. It is a common filler for paint, plastics, rubber and water filtration and employed in sandblasting, grinding, abrasives and scouring cleansers. As a result, occupational exposure to crystalline silica is one of the common occupational hazards on a construction site. Health effects that result from overexposure to crystalline silica include breathing difficulty, lung irritation, decreased pulmonary function, progressive respiratory symptoms, and silicosis lung disease and/or lung cancer. According to IRSST Report R-771, workers in construction face a serious risk of overexposure to crystalline silica. Some of the dangerous occupations include pipeline labourers, drillers, bricklayer – mason, cement finishers and underground workers (IRSST Figure1 ). 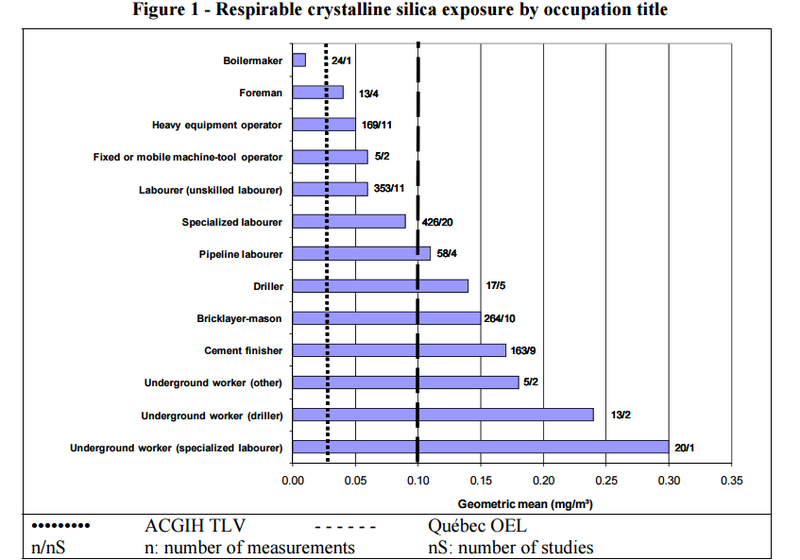 For these occupations, the geometric mean silica exposures exceed the Quebec and Ontario respirable silica legal occupational exposure limits (OEL) of 0.10 mg/m3 TWA. Occupation is not the only factor that needs to be considered when evaluating the risk of silica exposure – tools, tasks and working materials should play an important part in assessing this risk. 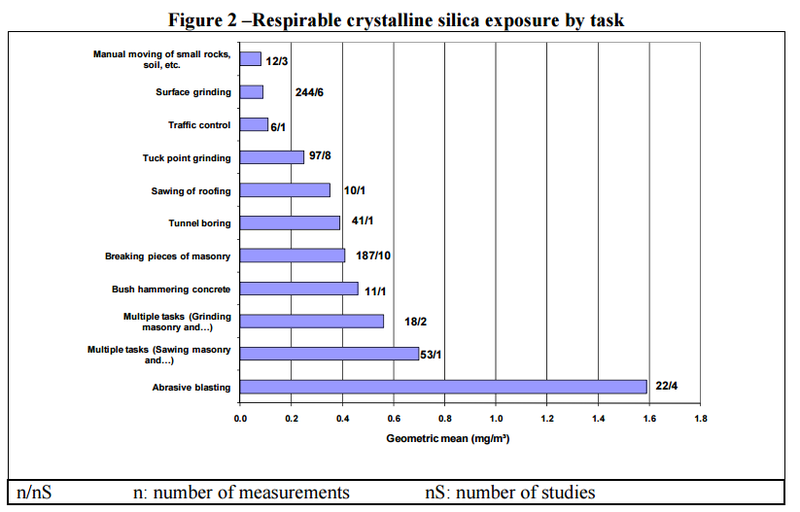 Some construction tasks expose workers to silica in amounts, which are 1 – 16 times the acceptable legal limit (IRSST Figure 2 ). These tasks include silica for traffic control, tuck point grinding, sawing roofing, tunnel boring, breaking masonry, bush-hammering concrete, grinding and sawing masonry and abrasive blasting. 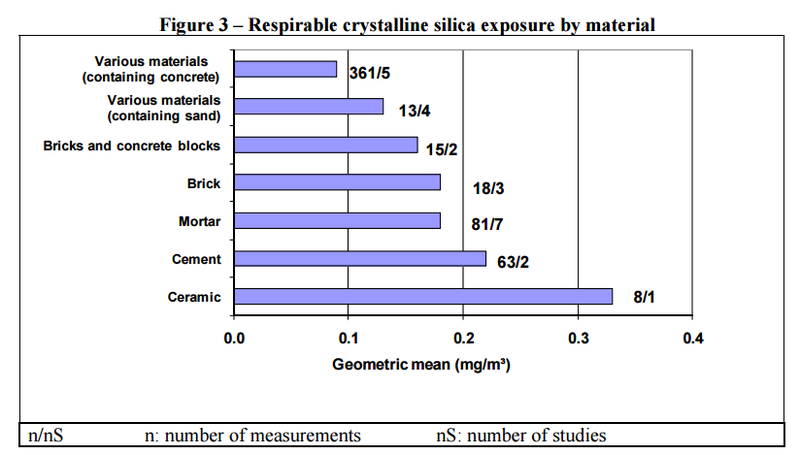 Some materials present higher exposures than others do with ceramic materials providing higher exposures than cement, followed by mortar and brick then by concrete blocks (IRSST Figure 3 ). 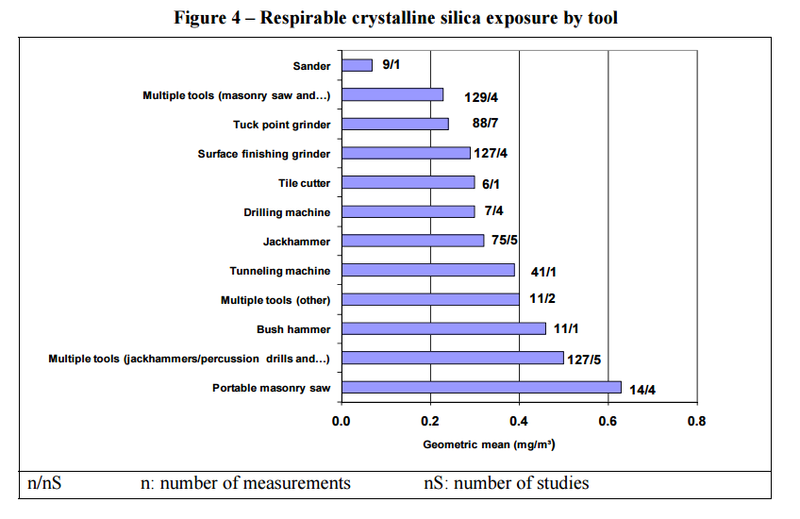 Finally, IRRST looked at silica exposure by tool and observed that all examples except for the sander exceeded the OEL for quartz silica in an 8-hour day. These tools in increasing order of exposure included masonry tools, tuck point grinder, surface finishing grinder, tile cutter, drilling machine, jackhammer, tunnelling machine, bush hammer and portable masonry saw (IRSST Figure 4 ). 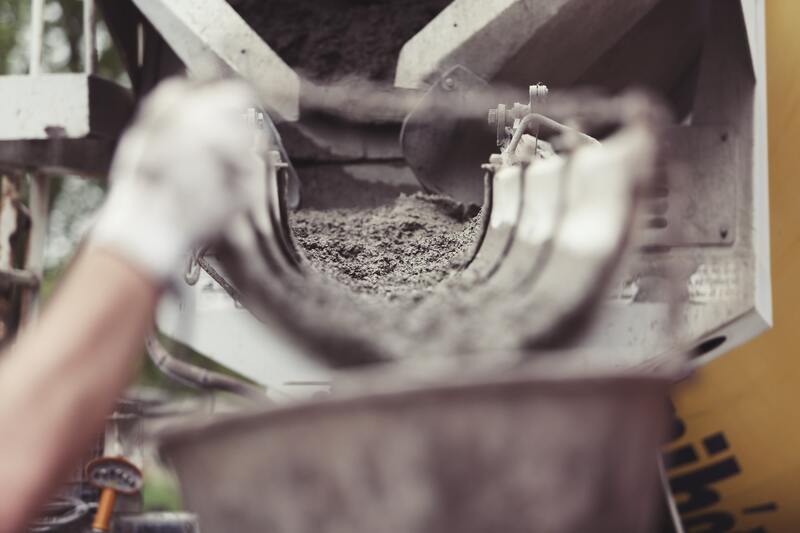 After reviewing all the aspects, which affect silica exposure in construction, it is imperative that engineering controls are implemented to protect workers. Built-in exhaust ventilation and water spraying are important and absolutely necessary engineering control measures to minimize worker exposure to silica dust. Administrative controls such as safe work procedures, worker training, on-the-job training, new worker orientation, safety meetings, hazard assessments, workplace inspections, silica awareness training and regular toolbox safety meetings are necessary to reinforce safe working with silica. The final control in the hierarchy of controls is personal protective equipment. Respiratory protection may include full-face air-purifying respirators, powered air purifying respirators or abrasive blast type CE supplied-air respirators depending on the type work being performed. Equally important is that the construction project has a respiratory protection program that meets or exceeds the requirements of CSA Standard Z94.4- 2011 (reaffirmed 2016) selection use and care of respirators to ensure workers are trained, fit tested and work safely with the personal protection that is provided. Ontario Regulation 833 s. 3 (1) requires that every employer shall take all measures reasonably necessary in the circumstances to protect workers from exposure to a hazardous biological or chemical agent because of the storage, handling, processing or use of such agent in the workplace. An assessment of worker occupational exposures is highly recommended. Where exposure is possible then a control program to limit worker exposure should be developed. 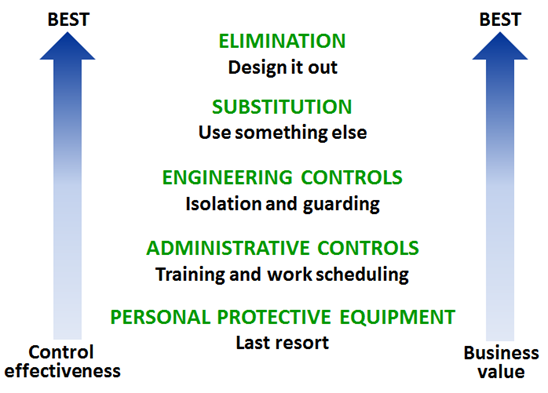 The control program should follow the hierarchy of controls to minimize worker exposure. The control measures in decreasing order of effectiveness range from elimination/substitution to use of engineering controls, followed by administrative controls and finally the use or respiratory protection. Engineering controls could include dust suppression techniques such as using tools with water spray, negative pressure containment, and shower facilities with dirty/clean change rooms, wash stations. Administrative controls could include silica hazard training, respiratory protection training, signage, personal hygiene requirements and restrictions on eating drinking and smoking while personal protective equipment might include respiratory protection, eye protection and work clothes/street clothes change out. Worker Safety with Silica: Key Questions to ask. Is there crystalline silica in your work site? Are your workers trained on the hazards of crystalline silica? Have all possible control measures been implemented? T. Harris Environmental Management (THEM) can help you assess workplace exposures, develop a silica control program, provide training and assess respiratory protection requirements. Contact THEM – your silica experts.